Has your child ever said to you, “Mommy, your tummy looks like a bagel”? I don’t think I have ever laughed so often and hard at any book I have ever read. I would absolutely want to be friends with this woman, because I think she would make my parenting adventure just a little bit less uptight. As a mother of small children, I could relate on a personal level to something in every chapter; and even the situations that I could not imagine myself in, Johanna Stein brilliantly crafted the events into a completely hilarious anecdote for the objective reader. 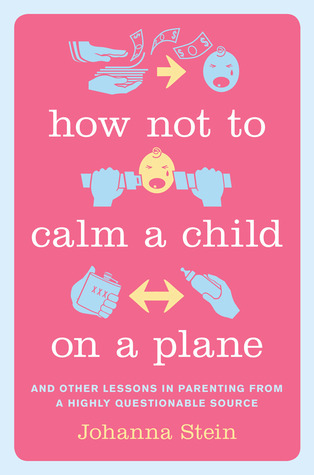 How to Not Calm a Child on a Plane is the extremely honest (sometimes shockingly so) selective memoir of her first six years of parenthood: pregnancy through to her daughter starting Kindergarten. Much of the book concentrates on the transition from wife to parenthood and Ms. Stein provides relatability to every parent in their efforts to raise their own children without too profoundly messing them up. She effectively captures her innermost thoughts and feelings, showing us that as hard as we try we can not be perfect; so we may as well have fun with the process. The language in this book is so vulnerable, yet humorous. Shocking, yet relieving. People want to hear this stuff, but nobody wants to talk about it; at least not in such a way where we could potentially be uncovered as the sole parent who has ever felt a certain emotion, be it initial disappointment in your baby’s gender, or the urge to laugh when your child takes a fall. When I first saw the cover of this book, I hoped it would be a humorous parenting memoir. How Not to Calm a Child on a Plane completely surpassed my hopeful expectations, delivering a thoroughly unique, frank, and completely gut-bustingly funny experience that won’t be soon be forgotten. I received an advanced copy of this book through Net Galley for review purposes. This entry was posted in Muse Reviews and tagged Book Review, funny, Gut-busting, Humor, Memoir, muse reviews, Net Galley, New mom, Parenting, Zinger. Bookmark the permalink.